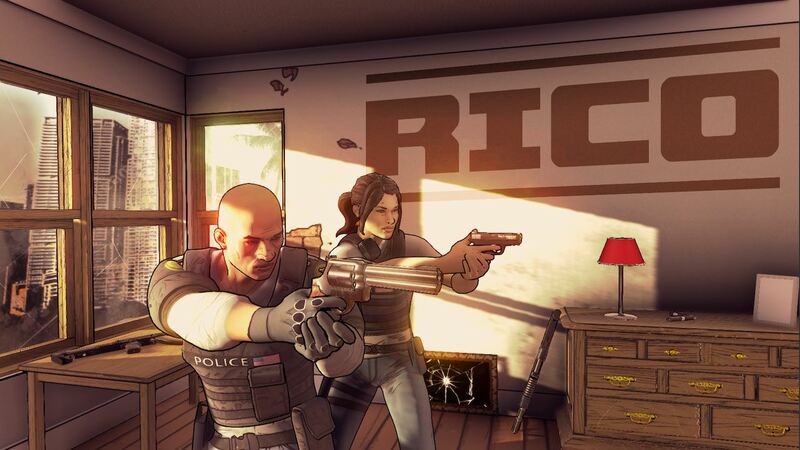 Rising Star Games and Ground Shatter have announced that RICO will release on Nintendo Switch next month, an arcade-paced, action-pumped co-op shooter. RICO stands for the “Racketeer Influenced and Corrupt Organizations” Act, which is a United States federal law relating to criminal organizations. But, that doesn’t matter, as you kick down doors, shoot bad guys, and exploit the element of surprise to gain the upper hand against overwhelming odds. This cooperative multiplayer first-person shooter will see you partner up with a friend in local couch co-op or online, to then blaze your way through an ever-changing series of procedurally generated levels. As a pair of loose-cannon police offers, you are given 24 hours to crack a case as part of an elite organized crime task force. With daily challenges to encourage you to keep coming back for more, you will unlock new weapons, weapon customizations, and traits, which will modify, enhance, and dramatically alter your abilities. RICO will release on the Nintendo eShop for Nintendo Switch worldwide on March 14th, priced at €19.99 ($19.99).